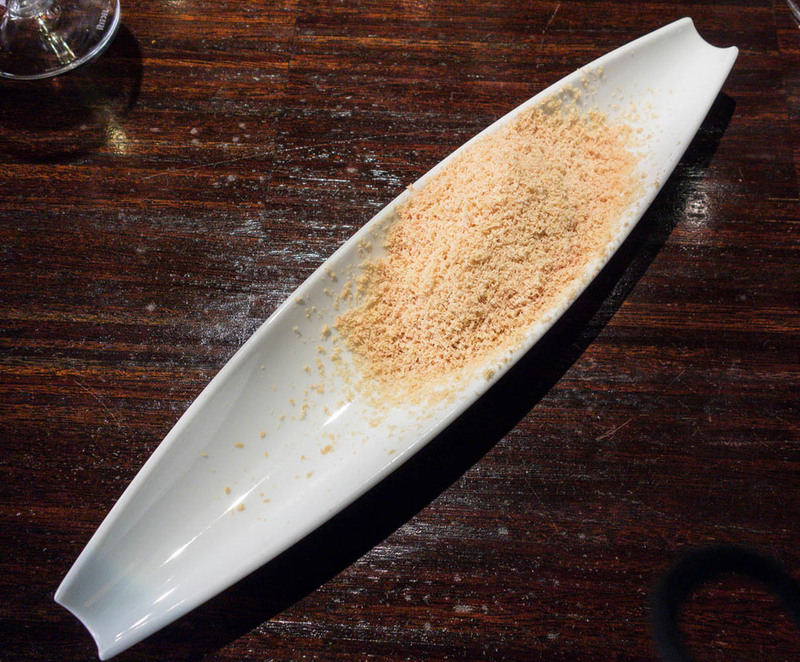 Where other restaurants come and go, Aromi has been a staple on the Prague dining scene. One of the first good Prague restaurants that could be called a "destination dining” place: more than just a mere neighborhood Italian place, Aromi has been attracting successful locals from near and afar despite being located in a residential district far from the areas exposed to mass tourism. It was also the place that gave birth to Riccardo Lucque’s empire of Italian-themed restaurants and bistros. And now, after ten years of its existence, Aromi has moved to a new location, taking over the space left by Sahara Cafe next to the Vinohradské divadlo theatre. La Degustation is a special place for us. You see, we met online. Before we even met in person, we chatted about our favorite places to eat in the city. Jan actually always wanted to go to “La Degu” but never had the chance, so he suggested a dinner there as the setting for the first date. Zuzi freaked out: “OMG, I don’t even know the guy and we’re going to have a date at La Degu?” So she bailed out, making up they had a closing at work (she was still a lawyer working for big law). In the end, we settled for something less fancy and quicker. Didn’t matter, really. We obviously hit it off. We did go to La Degustation some time later to celebrate Zuzi’s birthday. In the meantime, La Degu became the first Michelin starred restaurant focusing on Czech food. We absolutely loved it: the food, the atmosphere, everything. Yes, it was pricey but we felt it was definitely worth it: familiar Czech tastes but with a modern presentation. Now we have decided to visit La Degustation again to celebrate our fifth anniversary. (Feels like the twentieth, Zuzi likes to say.) We were a bit nervous: we have been recommending it to our guests but have not really eaten there for nearly two years. Would it be still good? We were lucky to get the table right next to the kitchen (totally by accident - no hidden perks there). La Degu changed its layout about a year ago and now has an open kitchen with a central table where all the dishes are put together in plain sight. It’s a great spectacle: you can see the chefs preparing the dishes and the whole scene looks like a Formula 1 pit rather than a kitchen. No talking but instead total focus on the food. Everybody knows exactly what to do. What we have always liked about La Degu was its relaxed atmosphere. Unlike some other Michelin star restaurants we visited, it does not feel stuffy at all and you don’t have to worry about using the wrong fork. Mr Sahajdak, the Executive Chef, wants a dinner at La Degu to be fun (he even said he wanted the guests to lick their fingers), and we think they have achieved that. So how was it? We absolutely loved it again. The reasons why we would recommend La Degu are simple. They try to use only Czech ingredients, especially for their Czech tasting menu. They have a purchasing officer who calls the Executive Chef every morning and tells him what he found that day on the markets and in the farms. Mr Sahajdak then creates the menu for the day. Their dishes are also based on old Czech recipes, especially those found in the 1894 cookbook by Marie Svobodova, a Czech Julia Child before there was Julia Child. They work with seasonal products only. They have a rule that no ingredient should be on the menu twice, with two exceptions: butter and salt. All the dishes made perfect sense to us as Czechs: local flavors fine-tuned to perfection in a stunning form and with modern presentation. We had the more extensive menu paired with Czech wines. The sommeliers do actually suggest Czech wines first, and they do have great wines, including limited editions that are rarely seen elsewhere. The number of sommeliers matches that of the waiters. Besides the wines, La Degustation pairs the cheese course with an IPA beer by Matuska, a Czech microbrewery. The dessert (bread ice-cream) is also paired with smoked grape juice, one of the highlights of the dinner by itself. We really liked all the courses. Our highlights included the smoked beef tongue with yellow pea and apple, which had fantastic texture and rich flavor; the perfectly cooked peeled barley, herbs and horseradish side that came with the chicken course; the melt-in-your-mouth poached trout with kohlrabi and almonds, and the “skubanky” course (absolutely amazing combination of silky potato dumplings with pork cracklings and kefir dressing), and.... you see we can't actually agree which dish we liked the best. For us, La Degustation fills a very big void on the Prague culinary scene: Czech cuisine approached in a playful and modern way. A visit to Budapest shows that the Hungarians are not afraid to update their traditional dishes. On the other hand, Czech food tends to be presented mostly as pub dishes - greasy and in huge portions - served with lots of beer. We think that's a shame because La Degustation shows that a modern approach to Czech classics can in reality produce exciting results. The only downside was the final bill :-) But still, comparing La Degustation to other Michelin star restaurants in Berlin, London or you name it, the experience was worth every penny.